They actually ship the Transit Connects here with the vans classified as wagons. Then, once they reach a processing facility in Baltimore, they are transformed into cargo vans, totally side-stepping the Chicken Tax. Smart, huh? The process of transforming a passenger "wagon" into a cargo van works like this. The rear windows are removed and replaced by a sheet of metal that's quick cured in place. The rear seats and seat belts are then removed and a new floorboard is screwed into place. Voila – five minutes after they start as five-passenger wagons, Ford has a bunch of two-seater panel vans. The seats are then shredded and the material is used as land fill cover. No word on what happens to the glass. Hmmm... I never expected that my reading of Autoblog would yield an example for my international trade class. All that time I was working, after all. The Wall Street Journal has more. While virtually all of the largest developed and developing nations have made domestic commitments toward creating more efficient, renewable sources of energy to cut emissions, none want to take the lead in fighting for significant international emissions reduction targets, lest they be accused at home of selling out future jobs and economic growth. The negotiations for a new climate change agreement to be signed in Copenhagen in December are badly stalled. With the agreement running more than 200 pages — including what negotiators estimate are a couple of thousand brackets denoting points of differences — diplomats and negotiators fear that the document is too unwieldy to garner a consensus in the coming months. For example, CBO concludes that the cap-and-trade provisions of H.R. 2454, the American Clean Energy and Security Act of 2009, would reduce GDP below what it would otherwise have been—by roughly ¼ to ¾ percent in 2020 and by between 1 and 3½ percent in 2050. By way of comparison, CBO projects that real (that is, inflation-adjusted) GDP will be roughly two and a half times as large in 2050 as it is today, so those changes would be comparatively modest. In the models that CBO reviewed, the long-run cost to households would be smaller than the changes in GDP because consumption falls by less than GDP and because households benefit from more time spent in nonmarket activities. Moreover, these measures of potential costs do not include any benefits of averting climate change. What I see as the trouble with CBO–known as the official “scorekeeper” for legislation being considered by Congress–doing a quantitative analysis of the “economic effects” of climate change policy, is that all their qualifying statements about their inability to quantify (in dollar terms) the main point of climate change policy (avoiding environmental damage and what that means for the broader well-being of our society) will be lost on the policymakers, and hence on the public as well. People look for the numbers in a CBO report and will surely use the numbers about what’s bad about climate change policy as a reason not to enact that policy, as long as there are no concrete numbers to support the merits of the policy. In other words, it’s hard for CBO to be the unbiased arbiter on policy evaluation if they’re only “tooled up” on one side of the debate. Indeed, the expected value is calculated as the probability weighted sum of the various outcomes. If we assign a value of infinity to "avoid complete destruction of human civilization" then, even if the probability is small, the expected benefit is infinite. Also on the subject of global warming, Mark Thoma points us to this WSJ column by Robert Stavins of Harvard. To his surprise, when [Budget Director Peter] Orszag arrived at the site of the annual U.S.-China Strategic and Economic Dialogue (S&ED), the Chinese didn't dwell on the Wall Street meltdown or the global recession. The bureaucrats at his table mostly wanted to know about health care reform, which Orszag has helped shepherd. "They were intrigued by the most recent legislative developments," Orszag says. "It was like, 'You're fresh from the field, what can you tell us?' "
As it happens, health care is much on the minds of the Chinese these days. Over the last few years, as China has become the world's largest purchaser of Treasury bonds, the government has grown increasingly sophisticated in its understanding of U.S. budget deficits. The issue has become all the more pressing in recent months, as the financial crisis and recession pushed the deficit to record levels. With nearly half of their $2 trillion in foreign currency reserves invested in U.S. bonds alone, the Chinese are understandably concerned about our creditworthiness. And this concern has brought them ineluctably to the issue of health care. The Chinese save such freakish amounts because consumer credit is scarce, insurance is rudimentary, and their social infrastructure is threadbare. They must often pay for houses in cash, and for medical procedures out of pocket. Update (8/20): Ilian Mihov suggests (with evidence) that healthcare and education costs played a key role in the rise of US consumption. So what is Krugman up to? Why become a denier, a skeptic, an apologist for 70 year old ideas, replete with well-known logical fallacies, a pariah? Why publish an essentially personal attack on an ever-growing enemies list that now includes practically every professional economist? Why publish an incoherent vision for the future of economics? The only explanation that makes sense to me is that Krugman isn’t trying to be an economist, he is trying to be a partisan, political opinion writer. This is not an insult. I read George Will, Charles Krauthnammer and Frank Rich with equal pleasure even when I disagree with them. Krugman wants to be Rush Limbaugh of the Left. Yikes. On his blog, a semi-response from Krugman. The International Trade Commission, an independent federal agency, ruled in late June that Chinese tire imports had indeed disrupted the domestic industry. The panel recommended that the president impose tariffs for three years, starting at 55 percent and then declining. Mr. Obama, who was required by law to decide on the recommendation by Sept. 17, announced slightly lower tariffs that will start at 35 percent and drop to 25 percent in the third year. Regardless of party, every president, at some point, and often for political reasons, has imposed restrictions on imports. George Bush did, Bill Clinton did, Ronald Reagan did (a lot), Jimmy Carter did, and so forth...you get the drift. With some exceptions, most of these restrictions were not too costly or too important: they usually involved small industries, and the restrictions eventually expired. So on the broad canvas of presidential trade policy, Obama’s decision is unexceptional. Of course, the timing of the administration’s action, coming off the economic crisis and increasing fears of protectionism, makes it a bit riskier than most. And China’s response could make a bad situation worse; let us hope that it is posturing for its domestic audience. Still, the disruption to world trade is significantly less than Bush’s steel safeguard action early in his term. When China was admitted to the WTO it agreed to allow the United States to impose tariffs to temporarily counteract the disruptive effects of an import surge. The agreement did not require the United States to show that China had in any way acted unfairly, simply that the growth of imports had seriously disrupted the domestic market. This clause was an important factor in selling China's entry to the WTO to interest groups in the United States. Therefore, it should not be surprising that the government would occasionally take advantage of a clause that it had demanded. Real Time Economics rounds up more reaction. Or, "you shall not crucify mankind on the cross of an informal 2% inflation target"
While accessible credit fuels growth, too much debt kills it. The entire institution of bankruptcy exists because we recognize that otherwise functional economic entities can be paralyzed by debt, and that it ultimately benefits economic growth to allow some means of wiping out debt and starting fresh. But even short of default, a vicious cycle can take hold. At a certain point households, firms, and even governments are forced to spend money on meeting short-term debt servicing obligations rather than on making long-term investments. What results is a form of debt serfdom. Farmers don't invest in new crops and land; businesses don't add needed productive capacity because every spare cent goes towards interest payments. Governments can't afford to provide basic services because they have to pay off onerous debts. Households can't send their children to college because credit card payments have eaten up their savings. Avoiding the deadening effect of too much debt on the economy is the kernel of wisdom found in numerous ancient traditions and scriptural injunctions that require formalized periodic debt cancellation. Deuteronomy commands that every seven years (that is, during the sabbatical year) debts will be forgiven "because the Lord's time for cancelling debts has been proclaimed" (Deut. 15: 1-2). In the Judeo-Christian tradition, it is called Jubilee. We don't have Jubilee in modern financial capitalism and for good reason: the understanding of moral hazard then wasn't quite what it is today. But if we are to emerge from the current crisis into an economic future of sustained growth and widespread prosperity, we are going to have to do something to lessen the burden that past debts now impose on investors, innovators, consumers, and the federal government. Failure to do so would likely lead to a Japanese-like lost decade of low or non-existent growth, or worse. The surest way to avoid such a fate is to jettison a central, indeed the central axiom of post-1970s neoliberal global capitalism, and that is to embrace a period of moderate, sustained inflation. That is, in essence, a modern version of the argument made by late 19th century populists who campaigned for monetizing silver, which would have caused an inflationary increase in the money supply. At the time, grinding deflation had raised the real value of debts, effectively redistributing wealth from midwestern farmers to eastern bankers (i.e., a farmer's mortgage payments, fixed in dollar terms, increased relative to his income from selling crops, which had fallen in price). Hayes is correct that high levels of household debt could be a serious drag on the recovery, as people seek to improve their balance sheets by holding back on spending. A little extra inflation could help in that regard, but it would potentially create new problems. Expectations matter. When firms and individuals make plans and enter into contracts, they do so based on their expectations of future inflation rates. From a lender's perspective, higher inflation means that interest rates must be higher to make up for the erosion in the real value (purchasing power) of the payments over time. In high-inflation environments, borrowers are willing to pay higher interest rates because they expect their nominal incomes to be rising. One reason that interest rates have been lower over the past two decades is that people have come to expect moderate inflation. An unexpected increase in inflation would reduce ex post real interest rates and redistribute wealth from creditors to debtors. That would be a short-term boost to the economy, but it would also change people's expectations of the future. An increase in expected future inflation would mean higher nominal interest rates now. This would work fine if the target were credible - if people believed that the increase was really just a one-time only event. But is a Fed which shifts its target around going to have much credibility? I doubt it. Interest rates would likely incorporate a premium for the risk that, next downturn, the Fed would ratchet up its target again. The effect of that premium would be to redistribute wealth to creditors, and to inhibit investment by making it more costly to business to finance projects. 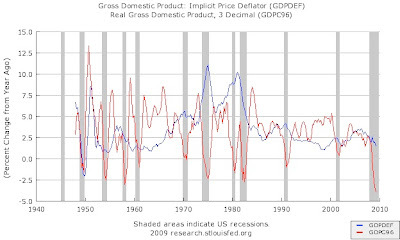 Furthermore, the inflation would be painful to reverse: disinflation can be very costly, as the experience of the early 1980's "Volcker recession" showed. Hayes is right that some of the inflation fears resulting from the Fed's unconventional policies are misplaced; the Bernanke Fed is rightly trying very hard to avoid deflation. To that end, it may make sense for central banks to target a slightly higher rate, as this would give them more room to ease monetary policy before hitting the dread zero lower bound (Real Time Economics reports John Williams has similar thoughts; see also this earlier post). But that is very different from a policy of deliberately inflating away debt. The annual real growth rate from 1948-1980, the bad old days of high inflation, was 3.7 percent. From 1980-2009, the brave new era of low inflation, it was a mere 2.9 percent. We are, in many ways, now reaping what decades of historically low inflation have sown: a massive upwards redistribution of wealth, an oversized financial sector, an eviscerated tradable goods sector, and a grotesquely large trade deficit. In other words, the imbalances and structural weaknesses of the post-Volcker economy, the ones that built up to create the crisis, were partly produced by the Great Disinflation that Volcker ushered in. Recovery will involve a fundamental restructuring of our economic engine, shifting from the supply-side nostrums of the past two decades that paradoxically led to an unhealthy pattern of asset bubbles and debt-financed consumption to policies that bolster global demand by investing in quality-of-life improvements and by raising incomes and wages worldwide. That means the seeding of a global middle class and recalibrating the share of profits captured by labor as opposed to capital. Such an economy will almost certainly be an economy with higher inflation than has been the case over the past two decades. While the stabilization of inflation at low levels may have contributed to some bouts of irrational exuberance, it is a bit of a stretch to attribute so much of the economic pathology of the last 30 years to it. Though the beginning of the rise in inequality roughly coincides with the Volcker disinflation, it likely has more to do with Reagan-era policies (lest we forget, Volcker was a Carter appointee) which discouraged unionization and lowered tax rates on high incomes. The trade deficits of the 1980's had something to do with the strong dollar resulting form Fed policy, but other factors, like China's massive intervention in foreign exchange markets, are more important for the imbalances of the past decade. Also, while 1980 is an important breakpoint in both monetary and other policies, comparing averages over 1948-80 with 1980-2009 obscures the fact that much of the growth came in the 1960's, while the inflation was (mostly) in the 1970's. While I believe Hayes' proposal would have more serious costs than he does, we are in times that call for rethinking some of our views. If the current slump turns out not only to be deep, but also persistent (along the lines of Japan's "lost decade"), it may be that a policy that creates some long term problems is nonetheless worthwhile. After all, "in the long run, we're all dead." (Hayes' article came to my attention via Matt Yglesias' blog). 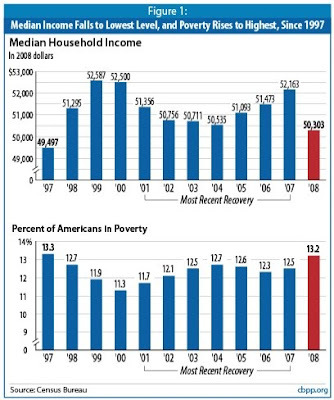 In the four decades that the Census Bureau has been tracking household income, there has never before been a full decade in which median income failed to rise. (The previous record was seven years, ending in 1985.) Other Census data suggest that it also never happened between the late 1940s and the late 1960s. So it doesn’t seem to have happened since at least the 1930s. Oh, and the poverty rate is up, too. Mark Thoma points us to the Center on Budget and Policy Priorties, which produced this chart: And that's as of 2008. Next year's report likely won't be pretty. See also Ezra Klein, Catherine Rampell. The Chinese tire safeguard tariff case moves forward. President Obama has until Sept. 17 to act on the International Trade Commission recommendation, and the Washington Post has the view from Albany, GA, home of a Cooper Tire plant. (See also this earlier post). Some regional trade deals in the right circumstances have indeed added to economic well-being. But the sorts of deals that are now being signed in Asia, just when multilateral trade desperately needs supporting, are likely to do less for their countries’ economies than for the egos of the politicians who sponsor them. Taken as a trend, they amount to a dangerous erosion of the system of multilateral trade on which global prosperity depends. Like the neoclassical-Keynesian synthesis of an earlier generation, the new synthesis attempts to merge the strengths of the competing approaches that preceded it. From the new classical models, it takes the tools of dynamic stochastic general equilibrium theory. Preferences, constraints, and optimization are the starting point, and the analysis builds up from these microeconomic foundations. From the new Keynesian models, it takes nominal rigidities and uses them to explain why monetary policy has real effects in the short run. The most common approach is to assume monopolistically competitive firms that change prices only intermittently, resulting in price dynamics sometimes called the new Keynesian Phillips curve. The heart of the synthesis is the view that the economy is a dynamic general equilibrium system that deviates from a Pareto optimum because of sticky prices (and perhaps a variety of other market imperfections). It is tempting to describe the emergence of this consensus as great progress. In some ways, it is. But there is also a less sanguine way to view the current state of play. Perhaps what has occurred is not so much a synthesis as a truce between intellectual combatants, followed by a face-saving retreat on both sides. Both new classicals and new Keynesians can look to this new synthesis and claim a degree of victory, while ignoring the more profound defeat that lies beneath the surface. Between 1985 and 2007 a false peace settled over the field of macroeconomics. There hadn’t been any real convergence of views between the saltwater and freshwater factions. But these were the years of the Great Moderation — an extended period during which inflation was subdued and recessions were relatively mild. Saltwater [New Keynesian] economists believed that the Federal Reserve had everything under control. Fresh­water [New Classical] economists didn’t think the Fed’s actions were actually beneficial, but they were willing to let matters lie. Freshwater economists who inveighed against the stimulus didn’t sound like scholars who had weighed Keynesian arguments and found them wanting. Rather, they sounded like people who had no idea what Keynesian economics was about, who were resurrecting pre-1930 fallacies in the belief that they were saying something new and profound. Krugman may be right. However, I think it may be premature to declare that combat has resumed. Krugman and Brad DeLong have found a number of examples of alarmingly pre-Keynesian thinking from some very big names in the field, but it is not clear they have a broad following. The recession presents a real challenge - and opportunity - for macroeconomists. While it would be natural for Minnesota and Chicago types to use more "freshwater" style tools to try to explain it, I am optimistic that most of the profession will be interested in convincing hypotheses of any degree of salinity. Justin Fox has similar sentiments, but Brad DeLong is less optimistic. Update (9/6): EconomistMom responds, with a Washington "engineering" perspective; she says "as I've gotten older, my elasticities have shrunk." On his blog, Krugman offers additional notes. The news from the August BLS report was not good (but less bad than earlier this year). According to the household survey, the unemployment rate increased from 9.4% to 9.7%. 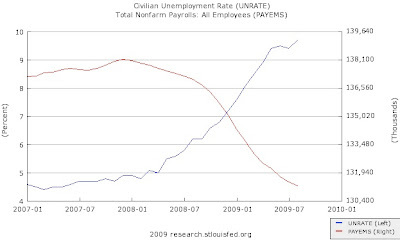 When I saw the headline, I was hoping the rise might be the artifact of increased labor force participation (recall the unemployment rate is measured as a percentage of those working or looking for work, so if improved prospects motivate people to re-enter the labor force, the unempolyment rate can rise), but it was steady at 65.5%. The establishment survey found a decrease in payrolls of 217,000. While rapidly rising productivity is good news in the long run, it implies a larger increase in output would be necessary to generate an increase in employment. Overall, the picture is consistent with an agonizingly slow turn in the business cycle; if this economy was a car, one would say that it has poor cornering and sluggish acceleration (but good brakes). For more, see the Times story, and roundups of reactions at Economix and Real Time Economics. After four years of negotiations and W.T.O. reviews, the Chinese government announced late Friday that it would comply with the organization’s ruling that China must reduce its steep tax on imported auto parts for cars that do not meet certain local standards. But the delay in changing its trade policies served to limit imports. During the lengthy negotiations, foreign automakers moved production to China on a large scale. The automakers with assembly plants in China have largely stopped using imported auto parts, partly to avoid paying the steep taxes on these parts and partly because international auto parts manufacturers moved production to China. Because there are fixed costs and comparative advantage is not static, the time involved in resolving disputes at the WTO matters. Since the case would almost certainly take a long time and the outcome was uncertain, it was worthwhile for manufacturers to pay the fixed cost of setting up in China. China was, in effect, able to protect an "infant industry," and induce investment in auto parts manufacturing (i.e., in terms of neoclassical trade theory, change its factor "endowment"). Therefore, by the time China "lost" the case, it had a globally competitive auto parts industry. Such "path dependence" is sometimes referred to as "hysteresis" after the property of metals that retain a magnetic effect after coming into contact with a magnet. More information about the case from the WTO website. I like that - "imperial benevolence" - but, really, we're not so bad as people think. Sigh.